Condo or Townhome: What’s the Difference? If you’ve been looking for a new home in the Bay Area, chances are good you’ve come across terms like single family, townhome, and condo. 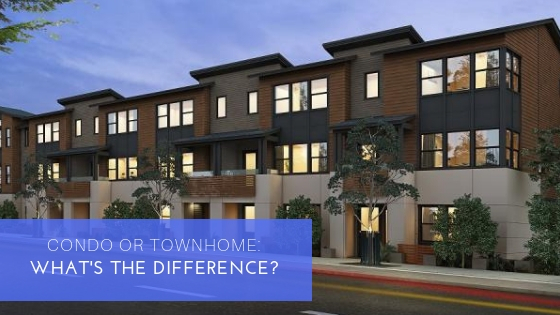 Single-family is pretty easy to decipher but understanding the difference between a condo and townhome can be a little confusing, especially when some people use the terms interchangeably. A condominium (or condo for short) is typically a single unit within a larger complex of buildings that is individually owned. While condos vary in size and style, they usually share a common wall with adjacent units. Residents own and are responsible for the interior of their unit only. A townhome is a single-family home that my share one or more walls with other units that usually two or more levels. Each unit is individually owned and the resident is responsible for both the interior and exterior of the home, just like a detached single-family house. So, what’s the difference between the properties? The differences between townhomes and condos lies in what each resident is responsible for. As stated before, condo residents are responsible for the interior of their specific units only while townhome residents have a bit more responsibility but also have a slightly higher degree of independence. Both property types may be covered by a Home Owner’s Association (HOA) that will manage the maintenance and upkeep of shared outdoor spaces, and landscaping to name a few things. In addition, the HOA will also be responsible for the condo’s exteriors. The differences between townhomes and condos are small so its up to each buyer to understand the benefits of each home type to determine which one is the best lifestyle fit. Ready to take a look at some homes? We have several communities featuring condos and townhomes, including our newest community Locale at State Street in Fremont. Visit us online at SummerHill Homes to view our communities and more today.